Hue is a two-dimensional puzzle-platform game where the protagonist, the titular Hue, is tasked with collecting the different colored segments of a special ring to find out what has happened to his mother. It's very clearly influenced by Limbo, but the spectrum-swapping mechanics give it a different focus. In my preview, I mentioned that Hue plays a lot like Limbo, and that I meant it as a compliment. Hue (pronounced "Hugh") shares many design elements with Limbo's unnamed protagonist, and is just as fragile. 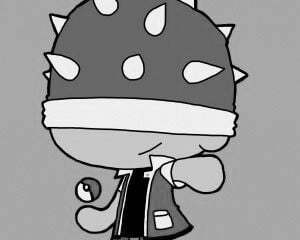 He also has pretty much the same moveset: he can jump, push and pull boxes, and throw switches to help him traverse the game's many puzzles. The difference lies in Hue's main gameplay innovation, a mysterious ring called the Annular Spectrum that allows Hue to shift the background color of the world around him. Once Hue has collected a few colors for his ring, he can use it to make objects in the world that match one of his colors invisible and inconsequential. Anyone who's played Ikaruga or Outland will be familiar with this idea; if it's the same color, it can't hurt you. 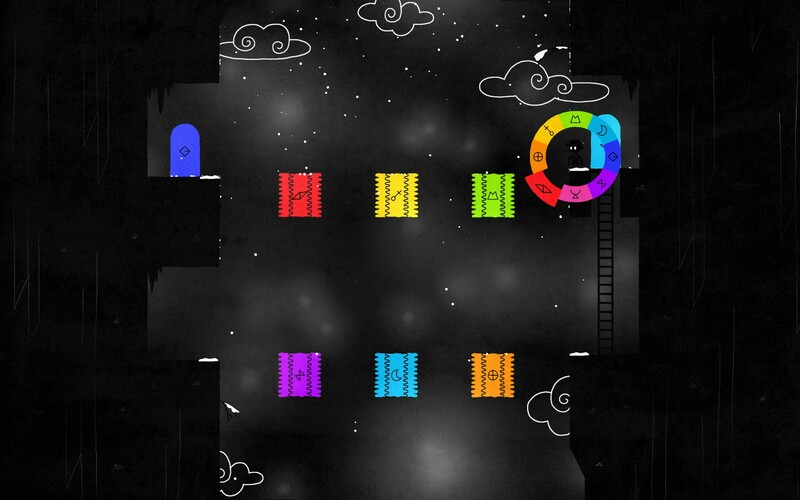 All of Hue's puzzles are centered around shifting from color to color, avoiding or nullifying the many obstacles and reaching the next area as you work to recover the full spectrum for your ring. Shifting colors is very easy, and is mapped to the left mouse button or the right analog stick on game controllers. Time slows for Hue and the non-interactive elements of a level go to black and white when you're in the color-selection screen. This is handy, especially when you're trying to select a specific shade under pressure. 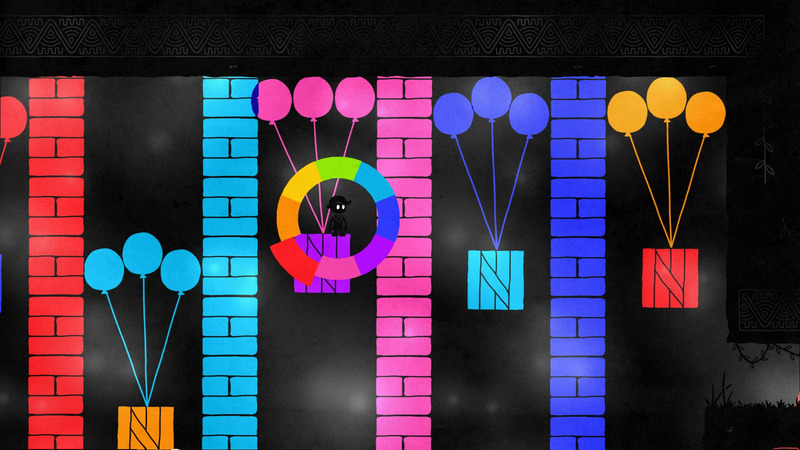 Lots of puzzles combine platforming with color shifting, so you'll frequently have to jump and swap colors midair. I died quite a bit while attempting to figure out the game's challenges, but I always felt like it was my fault, not the controls'. Dying in Hue doesn't carry too much in the way of consequences. If you make a mistake, your avatar's eyes will change from glowing orbs to glowing X's, like a comic book character. After that, you're sent back to the beginning of the current puzzle room to try again. If you get stuck or want to retry a puzzle, you can do so through the menu, or just leave and re-enter a door. The lack of penalty encourages experimentation, so there's no harm in saying to yourself, "I wonder if that would work?" and trying it out. The lack of gore means this game is also reasonably kid-friendly, though I did notice Hue's head came off and rolled away once after I got too close to an active laser. 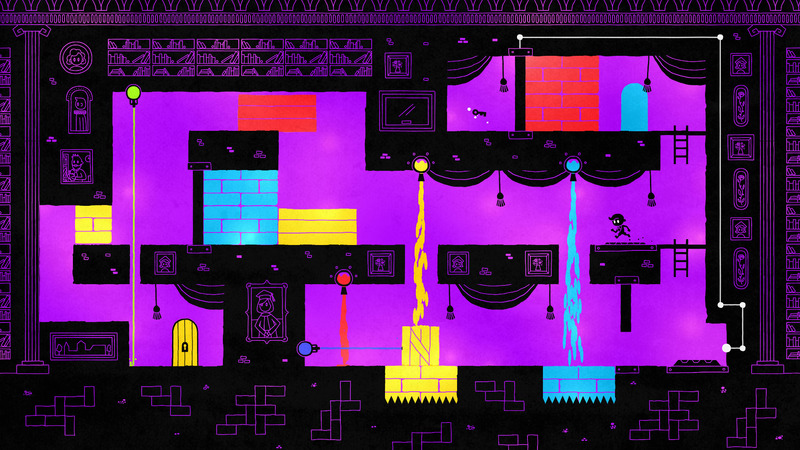 Hue is paced well, and does a great job of demonstrating through gameplay what you need to do before you have to do it. The first couple of hours are dedicated to collecting all of the colors for Hue's Annular Spectrum. Once you have the full range of colors available to you, the difficulty ramps up in earnest, adding new rules and elements to deal with regularly. By the end, you'll have to account for different colors of lasers, balloons, trampolines that change color every time you bounce on them, Thwomp-like skulls, spikes, and jets of paint that can recolor level elements. There aren't any enemies or obstacles that you won't see coming, so it's always a matter of figuring out what to do next and then executing rather than using twitch reflexes. That said, I found the puzzles satisfying and felt a sense of achievement after clearing each one. Hue's audio is pleasant and unobtrusive. Relaxing, low-key piano music plays in the background through most of the game, though it does ramp up a bit in some of the later levels. You'll come across letters from your mother from time to time that are read to you like an audiolog as you move through some of the longer, more featureless areas. The voice acting is well done, and does a good job of narrating the backstory as you move to the next section. Hue is pretty linear, though you do have the option to return to completed levels to search for hidden beakers after finishing them. Doing so is an interesting challenge, but doesn't appear to unlock anything other than an achievement. I gave up on backtracking fairly quickly, since the featureless areas I mentioned above are pretty boring without the audio to distract you. One of the complaints I had about the preview build of the game doesn't appear to have changed in the retail version. Several of the colors on the color wheel are very close together, and I sometimes had a hard time determining whether an object was supposed to be yellow, the yellowish-green shade, or the yellowish-orange shade on the left of the color wheel. The purple and pink shades near the bottom are similarly confusing. This may have been due to the color options on my monitor, but a calibration option would be helpful here. Fortunately, Hue does offer a color-blind option, and I'd recommend that everyone playing this game should turn it on immediately. This mode adds runic shapes that correspond to the different shades of every colored element of a level, removing all the guesswork. One other thing I was disappointed by is the single save slot. I started the game over to do the review, just to make sure nothing had changed between builds. When I did so, the progress I had made before was gone. Without resorting to backing up my files manually (not an option on the console versions), there's no way to show this off to a friend or to let your little brother play. A minor problem to be sure, but I can't understand why there aren't multiple save slots. Hue is a well-crafted, enjoyable experience. I don't usually like physics-based platformers, but the controls are simple and responsive enough that I never felt like a death was anyone's fault but my own. Its visuals are sparse but clean, and the puzzles gave my brain a workout. It's a little brief, clocking in at four to six hours, but that just means it doesn't overstay its welcome, and it left me wanting more.